The fifth edition of the Pune Invitational Supercross - the largest Supercross event in the country -is set to take place on the 10th of February 2019 at Mundhwa Playground in Pune. The event, organised by Aashan Sports, is set to be even bigger and better this year. The reason for this is the new "All Stars Race" that will feature national and international riders competing against each other. At the curtain raiser for the event, 30 riders were auctioned, with six teams - Ajmera Racing India, Stallion Riders, PB Racing, Ibex Sports, Lileria Motorsports and the Gagan Developers Supercross Team - all bidding for the best riders. The 30 riders were split across four categories - SX-1 - Foreign Pro, SX- 2 - Indian Pro, SX- 3 - Indian Experts, SX- 4 - Indian Rider (Juniors). Each team had to choose six riders with a fixed team composition of one SX-1 rider, one SX-2, and two SX-3 and SX-4 riders in each team. High profile riders competing in the fifth edition of the Pune Invitational Supercross include, Travis Pitt, Dustin Phares, Aaron Mare, Michael Docherty, Vitaly Gusev, Georgy Gusev, C D Jinan, Rugved Barguje, Ishan Dasanayake, Prithvi Singh. Junior riders also include the likes of Yuvraj Konde Deshmuk, Karan Karle, Sarthak Chavan, Prajval Vishvanathan and Tanika Shanbhag - a 16 year old female rider from Satara, and the only woman in across all categories. Speaking of the fifth edition of the Pune Invitational Supercross, Eeshan Lokhande, joint director, Aashan Sports said, "The Pune Invitational Supercross, which started as an experiment to give boost to unconventional sports in India, today it has excelled to unimaginable heights. Our infrastructure and the stature of our riders makes us India's biggest Supercross racing event." Present at the curtain-raiser was KP Aravind, who has become the second Indian rider to complete the gruelling Dakar Rally, who unveiled the winner's trophy. Speaking at the event, Aravind said, "It's is indeed a matter of great pride to be associated with such a league. 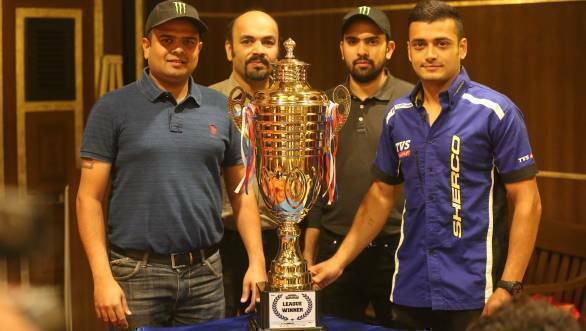 The league has turned out to be a harbinger for the sport where the national and international riders get a chance to showcase their talent. The quality of the league has immensely value added to overall development of the sport. Also, the league has played a significant role in providing young riders a platform to showcase their talent and also give them a feel of competitive sport at a very young age."